The cryptocurrency world has seen a rollercoaster ride in the past year. This included Crypto Exchange crashes, Bitcoin rises and slumps, wallet hacks and what not. Though the market cap as a whole has been increasing over the years, Bitcoin’s exclusive dominance to the % of Market cap is getting reduced by the new revolutionary cryptocurrencies. About 303 ICOs have taken place this year already, which surpasses the 210 ICO count of 2017. Only 48% of these have been successful. All this has obviously made it crucial for the market to have a more stable backdrop. This market opportunity was seen and has been successfully met with a revolutionary new cryptocurrency known as Ligercoin. Ligercoin is a cryptocurrency that is based on the EthereumBlockchain and is powered by Smart Contracts. It helps users to gamble safely in both offline and online Casino and Fantasy League platforms, and Live Betting Websites. Ligercoin aims to disrupt the market of Offline and Online Casinos, Fantasy Sports Portals, and Live Betting Websites. This places Ligercoin in a big industry that is continuously growing. The Offline Casino market is evaluated at approximately $240 Billion with about 7000+ Casinos around the world. This is expected to grow at a CAGR of 6.8%. On the other hand, the Online Casino marketplace is considered to reach a potential of $100 Billion in the coming 5 years with a CAGR of about 13.5%. Similarly, the Fantasy Sports market is another emerging sector. Though it is a relatively small market currently, it is growing at a remarkable rate of 25% CAGR. 51% of the players have an average annual income of $75,000 and the average spend of the players being $556. This proves that Ligercoin is tapping the right industry at the right time. Liger finds itself at the heart of a promising future with an aim to achieve a 1% market share by 2022 that amounts to a whopping $4 Billion. This increases the use cases of the currency which in-turn increases the demand, driving the price up. The market prices of cryptocurrencies are always subject to extreme volatility. The Volatility Index that takes into account the market of 6 leading cryptocurrencies(BTC, ETH, XRP, LTC, DASH, XMR) substantiates this theory. Ligercoin tames this beast with its unique staking mechanism. Liger allows token holders to stake their tokens to the Casino. This makes them virtually be on the Casino’s side on the bets. The win of the Casino is then distributed to all the stakers in the ratio of their contribution. This unique system also ‘burns’ a small part of the earnings. This reduces the supply and increases the demand to help the price move up. There are two aspects that can drive the demand up or down - adoption of the coin and the number of coins in circulation. The demand will increase as Ligercoin penetrates the market, while the Burning Mechanism will ensure that the number of coins decreases. Couple this with the realization that the staked coins also go out of circulation and the price rise becomes exponential. The future of Ligercoin looks really promising. The Liger Wallet makes it possible to place bets at an offline Casino table in Vegas while being in bed at home. Moreover, Ligercoin has the potential to eventually be the most stable cryptocurrency. The coin will be largely adopted since no geographical restrictions exist. Also, seamless synchronization of offline and online Casino environments is a remarkable innovation on its own. 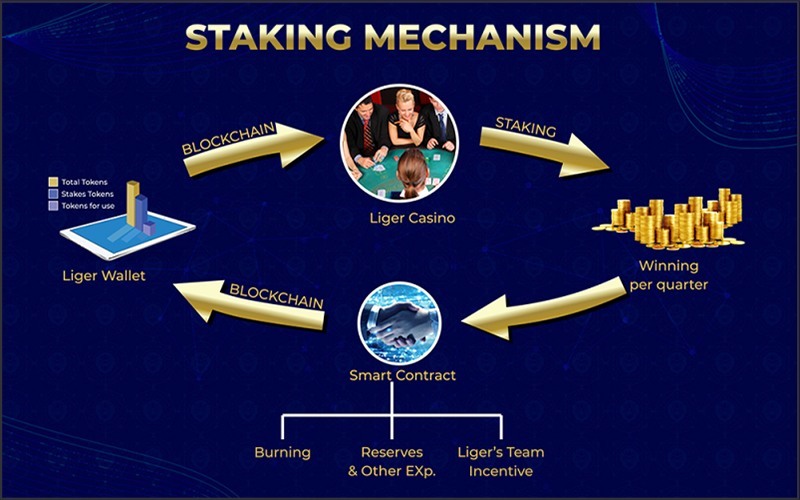 Liger’s core Team with a rich domain expertise across the Casino, Media & Sports and Financial Services Industries and their Technical expertise with BI and BA exposure in some of the biggest companies will be ideal to execute the processes on the ground. Hence, to sum it up, higher technological adoption coupled with a booming market paves way for an optimistic future for Ligercoin and makes it one of leading cryptocurrencies today. Founder and CEO- Francis Fitzpatrick | Co-Founder- Pratyush Bhartiya. Techsutram urges readers to conduct their own research with due diligence into the company, product or service mentioned in the press release. Techsutram does not endorse, nor is responsible for any material included in this press release and isn’t responsible for any damages or losses connected with any products or services mentioned in the press release.